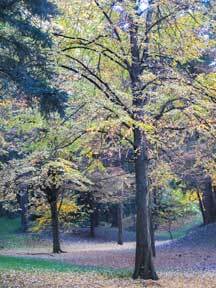 Perhaps the most graceful deciduous tree in the Park is the katsura . 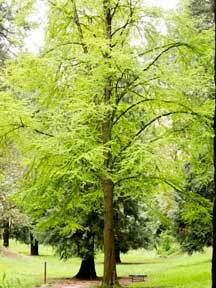 Native to China and Japan, the katsura is the Japanese word for “tree”. 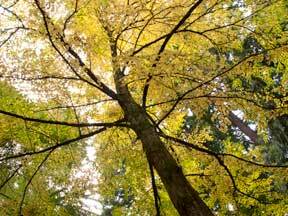 In the fall, its rounded leaves put on a show as they glow in shades of yellow or pinkish yellow. Some say that when the leaves fall, the tree produces a fragrance that some call spicy; others compare it to brown sugar. 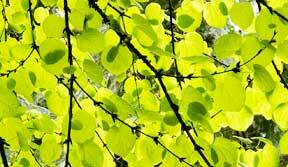 The Katsura Tree has been around for a very long time. Fossil records date its existence to 1.8 million years. It even grew across North America and Europe until it vanished from those areas during the Pleistocene Era. Katsura was introduced in 1865 by Thomas Hogg, who sent seeds from Japan to his brother’s nursery in New York. Katsuras can grow to a height of 60 feet. The katsuras in Pier Park can be found growing in the “valley” near disc golf hole # 4. Hatchet damage to at least 14 trees!